When I was principal of Yeshiva High School of Atlanta, I had a conversation with a board member who was a Holocaust survivor about the Holocaust Museum that was being built in Washington, D.C. He shared with me his feeling that it was not a wise use of community funds which could be better utilized to support Jewish day school education. I empathized with him since part of my job was to raise money for the school and I, too, felt that more community money should be directed towards Jewish education. A couple of years ago, I had the opportunity to speak to my friend again and he shared with me his change of heart about the Holocaust Museum. Now he felt glad that the Museum was here to teach many subsequent generations about the Holocaust. He never envisioned years ago that there would be Holocaust deniers and that anti-Semitism would be alive and well in the world after the atrocities of the Holocaust. Never could he have imagined leaders of so-called civilized nations calling for the annihilation of the Jewish state. The world had changed and it was not for the better. Evil was a potent force in the 21st century, and the Holocaust Museum was an important agent of moral education challenging the perpetrators of evil. The conversation brought back memories of my own innocent childhood in Mt. Vernon, New York, when everyone thought, post World War II, post- Holocaust, that the world was now enlightened, that there would be war no more, and that our collective human future was bright. 9/11 brought all that optimistic thinking to an abrupt halt. The Batman trilogy of films deals metaphorically with how we come to terms with this new world where evil is real and ubiquitous. The reality of evil in these narratives undercuts our assumptions about the basic goodness of man and leaves us on edge. 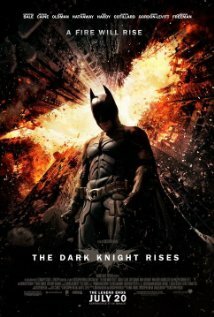 The Dark Knight and The Dark Knight Rises present two villains who are the personifications of evil: the Joker and Bane. The Joker represents the chaotic nature of evil; Bane represents the committed terrorist, for whom death and destruction are liberating events. Bruce Wayne, aka Batman, begins with a conventional understanding of the Joker’s criminal mind. He tells his butler, Alfred: “Criminals aren’t complicated. I just have to figure out what he’s after.” Alfred wisely responds: “You don’t fully understand. Some men aren’t looking for anything logical, like money. They can’t be bought, bullied, reasoned, or negotiated with. Some men just want to watch the world burn.” Bruce is ambivalent about how to deal with the Joker and Bane, and it takes him a long time to understand how vicious they are and how he must change his preconceptions about the nature of evil people. This perhaps can give us some understanding about the Biblical approach to unfettered evil, such as we find in Amalek, the arch-enemy of the Jews who attacked the old and weak as they were leaving Egypt. The Bible tells us to eradicate this evil and for the compassionate Jew, this is a hard business. On Passover at the Seder, we are bidden to spill out drops of wine from our cup when we recount the ten plagues because our cup of joy is never full when others have suffered. Even when justice triumphs, we feel for the victim who suffers. The Ethics of the Fathers also cautions us not to rejoice over the fall of the wicked even though he is deserving of punishment. Moreover, the Talmud recounts the story of Beruriah, the wife of Rabbi Meir, who, when her husband wanted to harm bullies who were constantly harassing him, exhorted him to pray that these sinners repent, not to pray that they die. The Batman trilogy is a brainy thriller. It asks us to leave our simplistic notions of good and evil at the door and to recognize that in our new and dangerous world, we cannot ignore evil. To be naïve in the face of absolute terror and evil places us at great risk. Purchase these movies on Amazon.com.